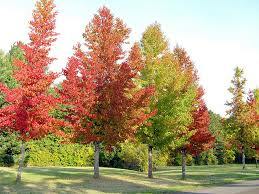 Buy Sweet Gum Tree at Low Grower Prices. Fast ship. The sweet gum tree is a beautiful shade-producing tree. It is made up of star-shaped leaves and a compact crown. The fresh gum tree is commonly found in campus's parks and residential areas. In the fall the leaves do not disappoint. The leaves will turn vibrant bright fall colors of reds, oranges, and burnt yellows. It is considered both an ornamental tree and a shade tree. When mature, the sweet gum tree can reach a height of 60-75 feet, and it has a gorgeous colorful spread of 40-50 feet at maturity. The sweet gum grows at a fast rate of one to two feet yearly. Sweet Gum Tree has a pleasant aroma. The pleasant scent readily identifies this tree that the leaves and bark produce. Many claims that this tree can be smelled from several feet away! Diverse in its uses, this tree is often seen in parks and even along walkways. Planning when planting this tree is essential. It has an extensive root system that could eventually disrupt particular areas if it isn't planted with growth in mind. The Sweet Gum Tree sports star-shaped, glossy green foliage throughout spring and summer, before blazing into autumn with a variety of hot colors. The tree provides winter interest by producing spiny round seed pods that hang on through winter. Squirrels and birds particularly favor the small black seeds inside. In spring, small clusters of white flowers appear to begin the process anew. The sap of the tree is pleasant smelling and has a chewing gum-like quality. The sap was used by Native Americans and pioneers alike, for medicinal purposes. The bark offers new texture, which resembles alligator skin. The wood is a beautiful hardwood used to make everything from furniture and flooring to baskets and wooden bowls. The tree grows large, and the spreading habit of its branches make it an excellent shade tree. It has a straight trunk that is about three feet wide. The tree grows in wooded areas and is identifiable by its star shape, including its five-pointed leaf lobes and bright green color. In the fall, the leaves turn red or yellow. Care should be taken when attempting to transplant, as this tree has been labeled "difficult," even by those who are experienced. The Sweet Gum Tree produces fruit. Fruit from this tree is often referred to as "gumballs." The gumballs hang off of the limbs, appearing as small ornaments. Brown in appearance, these fruits appear prickly. One fruit may contain up to 50 seeds. Squirrels, chipmunks, and birds often eat the seeds themselves. When planted in a yard, this tree can attract various types of wildlife. Do to the sweet gum tree’s large size, it makes for a beautiful shade tree for the yard, and thus it is a favorite tree for using in landscape designs. The tree is also known for its fantastic fall foliage. The leaves on the tree can range from yellows and oranges to bright reds and deep purples. The colorful foliage stays on the trees until late in the fall season. The ornamental seed pods, called gumballs, remain on the tree throughout the winter and fall in the early spring. The gumballs contain black seeds that are eaten by squirrels and birds.